Skin cancer can easily remain undetected because a cancerous spot may look like a harmless mole, a pimple or even a patch of dry skin. However, there are a few key ways to tell the difference. A good start is to perform a skin self-examination every month. When examining your moles, consider these five “ABCDE” rules for the early detection of melanoma. You should have any suspicious moles examined by a board certified dermatologist. Asymmetry means that something is not even. It is one of the most common skin cancer symptoms because cancerous moles tend to grow abnormally. Typically, a benign mole is smooth and symmetric. If you look at the mole and trace a straight line through the middle, each of the halves should be roughly the same size and shape. However, a cancerous mole may look asymmetrical, so the two sides will not match. Benign moles tend to have an even, defined border. You can easily tell where the mole starts and stops. 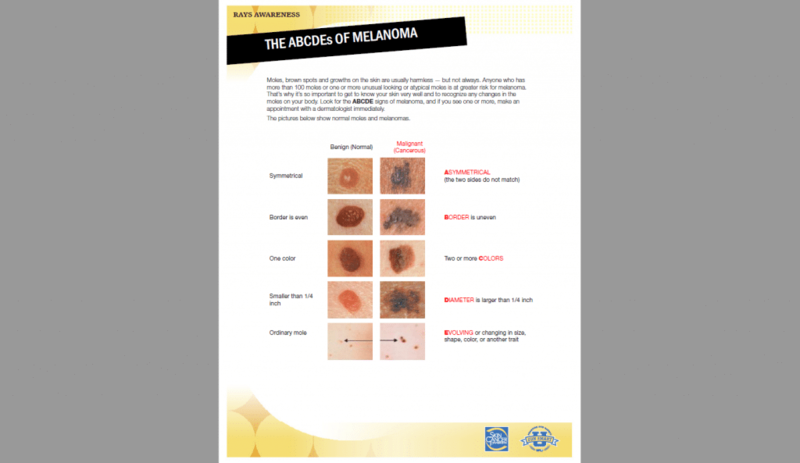 Borders for melanomas tend to be uneven. They might look like they fade into the surrounding skin gradually, or the edges might look crooked or blurry. Healthy moles can be one of a wide range of colors. A mole may be pink, tan, brown, or even black. However, benign moles are generally a single color. If a mole has two or more different colors in it, it may be cancerous. You should also keep an eye out for moles that have changed color. Diameter refers to the overall size of the mole. It is possible for a small mole to be cancerous, but the average melanoma grows to be at least 6 millimeters wide. You can check to see if your mole is smaller than this size by comparing it to a pencil eraser. Any mole that grows to a size larger than ¼ inch should be examined by a dermatologist. This may be the most important consideration. The evolution of a mole over time is one of the primary things to consider when looking at a mole. Skin cancer tends to cause changes, so any visible change to the mole, especially over a short period of time, may be cause for concern. In addition to any moles that demonstrate one of the ABCDE criteria, other types of skin cancer may present like a sore that never heals, a pimple that does not go away, or a scaly or bleeding patch of skin. If you notice any of these potential skin cancer symptoms, it is important to visit a dermatologist as soon as possible. Dermatologists can perform tests to make a diagnosis and help you get the best treatment possible, if needed. A prompt diagnosis can make a huge difference in your overall health and well-being. If you have any concerning lesions, request an appointment today. This entry was posted in Clinical Dermatology, Skin cancer. Bookmark the permalink.